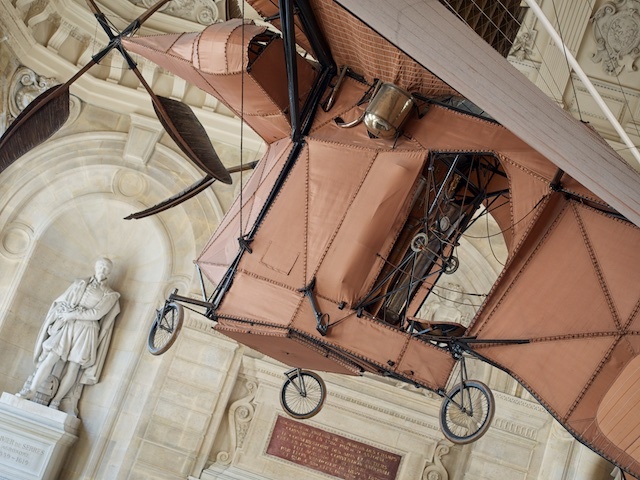 Anyone with a Jules Verne bent could do worse than spend a few hours wandering the Museum of “Arts et Métiers”, broadly the industry and technology museum. A visit should be compulsory for devotees of Steampunk, the modern movement that engages itself in “Victorian” re-engineering of modern objects, for here one can find examples of pretty much everything that ever was good, or not so good as machinery and technology evolved. The aeroplane that made the first ever flight is there, and no that didn’t happen at Kittyhawk, as is the gloriously steam powered creation with the feather propellers that is perfectly intact no doubt because it never crash landed. To have done so would have implied a take-off. What about the first every powered vehicle? It is a monstrous steam powered ox cart, famous for demolishing a barn on it’s first run, sending its inventor off madly in search of pencil and slide rule to begin development of the “stop” button, and “brakes”. Then we turn a corner and are brought back to earth with the same sort of thud that no doubt Mr “of course my steam powered bird will work” experienced. We arrive in the last century, (the twentieth one for those who have lost count) among objects which we have owned, yet hold complete fascination for the groups of high school children. It is the same fascination that we have for the things describe above. They stand in awe as they are shown a telephone with wires connecting it to the wall, my first digital camera (a Canon Ixus), and a television set with rounded corners that only received pictures in black and white. We moved hastily on, lest the guide should mistake us for part of the exhibit, artefacts from a century gone.